Selena Lasota attempts to elude a defender. The freshman scored a combined 9 goals in Northwestern’s two games in the NCAA Tournament to lead the Wildcats into the quarterfinals. It was more of the same for Northwestern during its second-round NCAA Tournament contest against Notre Dame — until the last four minutes of the first half. Then, as often happens with the No. 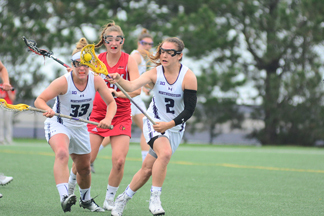 8 Wildcats (14-6, 3-2 Big Ten), NU flipped a switch and scored four times before halftime. The Cats rode that momentum through the second half, through the heavy fog coming off of Lake Michigan, and all the way to a 16-11 win over the Fighting Irish (11-9, 3-4 Atlantic Coast). NU advances to face No. 1 Maryland — who took care of Massachusetts 19-8 on Sunday — in the NCAA quarterfinals next Sunday in College Park. A slow and sloppy start on a chilly Mother’s Day eventually turned into a record-breaking day for the Cats. NU had three players with hat tricks and then some, with junior Kaleigh Craig leading the way with a career-high 5 goals. After staying silent for much of the first half, Big Ten Freshman of the Year Selena Lasota made mincemeat of the Notre Dame defender assigned to face guard her and scored 5 goals on just six shots. Lasota moved into the No. 9 spot in program history for goals scored in a single season, with 67 so far. Sophomore Sheila Nesselbush, working efficiently as always on both ends of the field, also scored a career-high 4 goals. Junior Christina Esposito and freshman Shelby Fredericks each contributed 1 tally. Coach Kelly Amonte Hiller said a timeout toward the end of the first half was the difference maker for the Cats, who outscored the Irish 9-4 in the second period. Though they came out even in draw controls — after beating Notre Dame 10-5 in the circle in the first half — NU limited turnovers from 10 to four and capitalized on two smart, tone-setting assists from freshman Corinne Wessels right out of halftime. Lasota’s 4 tallies came after that momentum shift, after she figured out how to shake her face guard. She took herself out of the offense often, allowing NU to play a six-on-six settled attack or, alternately, sprinting directly in front of the crease from the restraining line in order to lose her defender in a footrace. The latter strategy worked — that’s how the freshman claimed the second goal of the second half. Lasota also sits at No. 10 nationally with goals per game, so Amonte Hiller was prepared to see stringent defense covering her in the NCAA Tournament. In its second-round win to move on to play NU, Maryland outshot Massachusetts 37-11, won 22-7 in the draw circle and kept turnovers to six throughout the game. When the Terrapins and Cats met in the regular season, NU lost 16-5. Craig said the key this time around will be confidence.